FIRST OF ALL;THEY ARE ALL TRULY BESPOKE.. 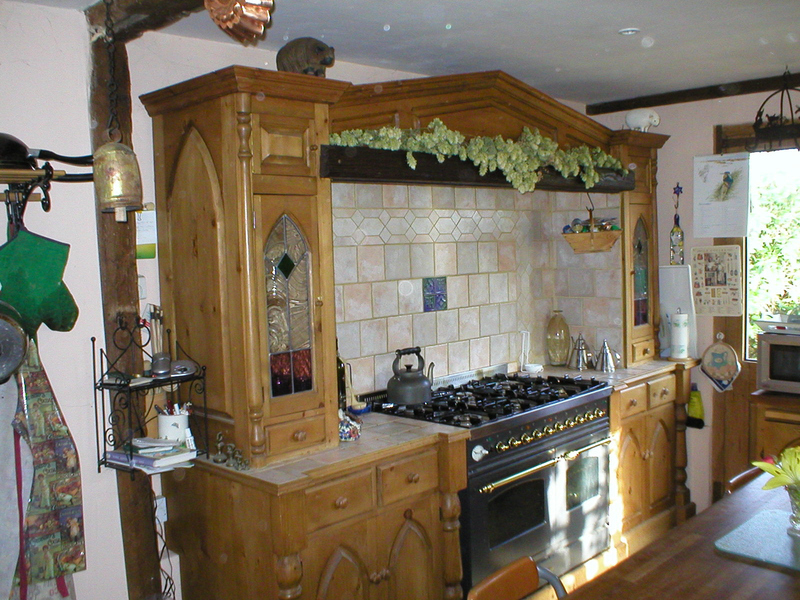 I BUY A LORRY LOAD OF TIMBER AND THAT IS WHAT YOUR KITCHEN IS MADE FROM.SECONDLY ; THERE ARE NO SET SIZES OR DESIGNS,WE WILL WORK TOGETHER TO CREATE WHAT BEST SUITS YOU AND THE CHARACTER OF YOUR HOME. THE KITCHENS I MAKE ARE ONE-OFF'S AND WHILE I'M WORKING ON YOUR KITCHEN,I WILL DEDICATE MY TIME SOLEY TO YOUR PROJECT;NOT TRY TO JUGGLE 2 OR 3 AT A TIME TO MAXIMISE PROFIT,BECAUSE THAT'S NOT WHAT I AM ABOUT AND THE QUALITY OF YOUR KITCHEN COULD BE COMPROMISED. THE DOORS SIT WITHIN A FRAME AND HANG ON PROPER HINGES.THE DRAWS ARE DOVETAILED ALL ROUND AND RIDE ON STEEL BALLBEARING RUNNERS.THE CARCASES ARE MADE FROM SOLID WOOD(not standard chipboard ones with a wooden front) AND A CHOICE OF HARDWOODS FOR THE EXTERIORS.WORK SURFACE OPTIONS ARE; GRANITE ,CORIAN ,STANDARD MELEMINE OR A CHOICE OF HARDWOODS. AS I AM SURE YOU CAN APPRECIATE,HAND CRAFTED ITEMS TAKE A LONG TIME TO MAKE,WAITING TIMES DO VARY,SO BE SURE TO ALLOW PLENTY OF TIME,BEFORE YOU ORDER,SO THAT YOUR KITCHEN IS READY WHEN YOU NEED IT.DEPENDING ON THE SIZE,DESIGN AND COMPLEXITY OF YOUR KITCHEN,BUILD TIME IS FROM 8 - 20 WEEKS,BUT ALWAYS ASK,AS THESE ARE ONLY GUIDELINES. OBVIOUSLY THIS VARIES TREMENDOUSLY,BUT IN ORDER TO GIVE YOU SOME GUIDENCE; I WOULD SAY MOST OF MY KITCHENS FALL INTO THE £15 - £30 K BRACKET.SOME ARE MORE,SOME ARE LESS. * The cost of a home visit will be charged "at cost" ie Travel + Accomodation. # I LIKE TO GIVE MY CUSTOMERS A HAND DRAWN, 2D DESIGN,SO THAT YOU CAN SEE THE OVERALL EFFECT THAT I WANT TO ACHIVE. IT WILL TAKE ME MANY HOURS TO SKETCH ALL THE IDEAS AND PERSPECTIVES,SO I DO HAVE TO MAKE A CHARGE FOR THIS SERVICE.IT IS A ONE-OFF PAYNENT OF £200,WHICH WILL NOT COVER THE HOURS INVOLVED,BUT DOES STOP PEOPLE USING ME AS A FREE DESIGN SERVICE ! YOUR FEE WILL OF COURSE BE REFUNDED ,WHEN THE KITCHEN IS ORDERED. ONCE YOU ARE HAPPY WITH MY DESIGN,YOU WILL NEED TO RESERVE A TIME SLOT BY PAYING A HOLDING FEE OF £1000. (NON REFUNDABLE) IMPORTANT: YOU MUST BE REALISTIC ABOUT YOUR SLOT TIMING,ESPECIALLY IF YOUR HAVING BUILDING WORK DONE.IF YOU ARE NOT READY TO PROCEED AT THE AGREED DATE YOU WILL LOOSE YOUR FEE.....AND WILL NEED TO RE-BOOK AND PAY ANOTHER FEE ! A DEPOSIT OF 50% IS PAYABLE PRIOR TO COMMENCEMENT,ONCE MADE A FURTHER 30% IS DUE WITH BALANCE ON COMPLETION.YOUR HOLDING FEE AND DESIGN FEE WILL BE DEDUCTED FROM YOUR FINAL PAYMENT. WELL,THIS IS THE EASY BIT; JUST CALL ME AND TAKE YOUR FIRST STEP TO YOUR BEAUTIFUL NEW KITCHEN.